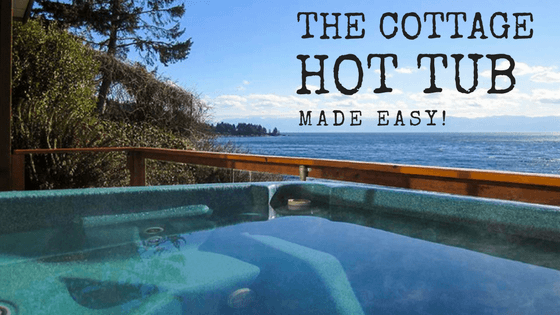 With Cottage and Cabin season soon upon us we thought we would talk about the special Cottage hot tub care that is required in more rural areas like a cottage or cabin. There is nothing like sitting in a hot tub with the dark star filled rural sky to look up at and enjoy. Taking care of your hot tub is pretty straightforward, really. Check your water chemistry every couple of days, or every few uses. Shock the water after heavy use. Empty, clean, and refill it every few months. Replace the filter once a year. That’s city hot tub care in a nutshell. Cottage hot tub care is a slightly different animal. 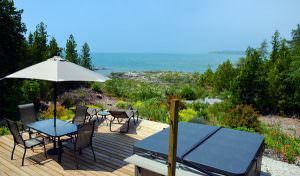 When your hot tub is at the cottage, hot tub care involves a few extra considerations. Most hot tubs are designed to use a fairly narrow range of city treated tap waters. They are also meant to be run year round. Rural hot tubs often get filled with well water and need to be shut down for the winter. That complicates things a bit for Cottage hot tub care. The first thing to keep in mind with well water is the mineral and metal level in the water can sometimes and often be high. You may also find phosphates, dust, rust, grit, sediment, arsenic, cadmium, chlorine, aluminium, H2S, iron, lead, copper, iron oxide, V.O.C.’s, and mercury in the well water. Really hard water or water with high iron content can make balancing the ph tricky. The wrong ph can make it difficult for the other chemicals to do their jobs. The end result is often either murky, cloudy water, or green soup. If the iron content is too high, shocking the tub can even turn the water orange! Generally, using well water only means the extra step of reducing the hardness and possibly the iron content of the water before you add the other chemicals. If you want to make sure, take a sample of your well water to most any water dealer and get them to test it. They should be able to recommend how to proceed. Aside from the chemical issues, there are some things to remember when draining and refilling your tub. If you are filling from a hose, it is a very good idea to use a hose pre-filter. This will strain out any debris and such before it gets into your tub. If you need to improvise a pre-filter, a stretch of pantyhose duct-taped over the end of the hose works. Also remember that your outside water probably doesn’t go through your house system. Inside water and outside water are not usually the same. Unless you use your cottage year-round, cottage hot tub care also involves shutting the tub down for several months a year. There is a right way to do this. When you drain the tub for the winter, make sure to get all the water out. All of it. A small amount of water left in an unheated tub over the winter can wreak havoc. Use a submersible pump to drain it if you have one available. It’s faster and does a more thorough job than the drain plug alone. Also don’t put the drain caps back on when the tub is empty. This will allow water left in the lines to evaporate. If your cottage is in a hard winter climate, blow out the pipes too to be sure. To blow out the pipes you can use the exhaust of your shopvac. Wipe everything down with a good cleaner. Clean the cover on both top and bottom with a cover cleaner and treat it with a protectant. Don’t tarp it over with plastic or you’ll come back to a musty, mildew-y mess in the spring. 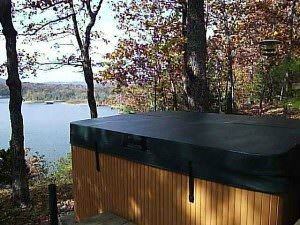 Your cover is designed to withstand the elements and is all the protection your tub should need while you’re gone. Remove the filter/filters from the tub. 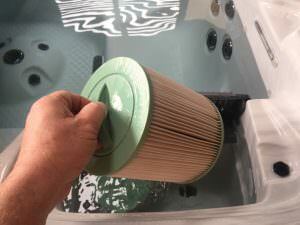 Clean the hot tub filters and store them in a dry place. Do not put them back in the tub when you are not using it, or they will mildew. Remember, you can’t spell ‘mildew’ without ‘ewww’. 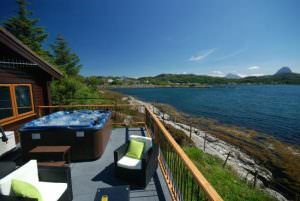 Cottage hot tub care isn’t particularly difficult. It just means a few extra steps to keep things running smoothly. Pay a bit of extra attention to your water chemistry and take care when shutting it down and you should be fine.